Jonathan Alter’s “The Defining Moment: FDR’s Hundred Days and the Triumph of Hope” was published in 2006. Alter is a journalist and author and was a columnist for Newsweek magazine for nearly thirty years. His most recent book “The Center Holds: Obama and His Enemies” was published in 2013. 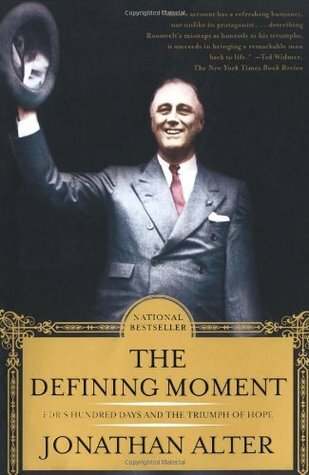 Despite its title, “The Defining Moment” is not a book focused exclusively – or even mostly – on FDR’s first one hundred days in office. Nor is it a comprehensive biography of Franklin Roosevelt. Instead, it is an enjoyable but perplexing book whose precise mission is never entirely clear. The first two-thirds of this 337-page book covers FDR’s pre-presidency in a solid but not exceptional manner. These thirty-one chapters define Roosevelt’s personality and character and create the historical context for his election as president. Unfortunately, coverage of this period is uneven and readers already familiar with Roosevelt will grow impatient waiting for analysis of the dramatic early days of FDR’s presidency. Once the book’s attention does turn toward Roosevelt’s first “Hundred Days” the narrative itself leaves the reader with the impression that this slice of history is not particularly deserving of special focus. This discussion lasts fewer than fifty pages and, like the rest of the book, contains no new significant insights. The book’s final chapter is reserved for a review of Social Security (signed into law two years later) and an Epilogue whisks the reader through the remaining eleven years of Roosevelt’s presidency. In spite of its structural flaws, this is an easy and generally entertaining read. The book’s tone also reveals its author as a journalist and not a historian or academic. It is written in “plain English” so it can be enjoyed by readers not normally drawn to history texts or biographies. And many of the author’s observations are strikingly cogent and convincing. The narrative occasionally borders on breezy, but nearly as often it dives into a topic with more rigor and substance than expected. As just one example, Alter’s description of preparations for FDR’s 1933 inauguration (including the drafting of his inaugural speech) is far more detailed and much more fascinating than anything I’ve read elsewhere of those events. And yet his four years as governor of New York seem an unimportant after-thought. Overall, Jonathan Alter’s “The Defining Moment” will prove refreshing to some readers and frustrating to others. General readers seeking a bit more than a cursory review of Roosevelt’s pre-presidency will likely be pleased. But anyone expecting to find a “Defining Moment” or who hopes to encounter decisive, penetrating coverage of FDR’s first hundred days will almost certainly be disappointed. I did not like this book. Maybe because I read many other great books of the era, and maybe this book could not survive a tough grading curve. It did not receive a passing score, from my learned perspective.